Clinton, Ontario. 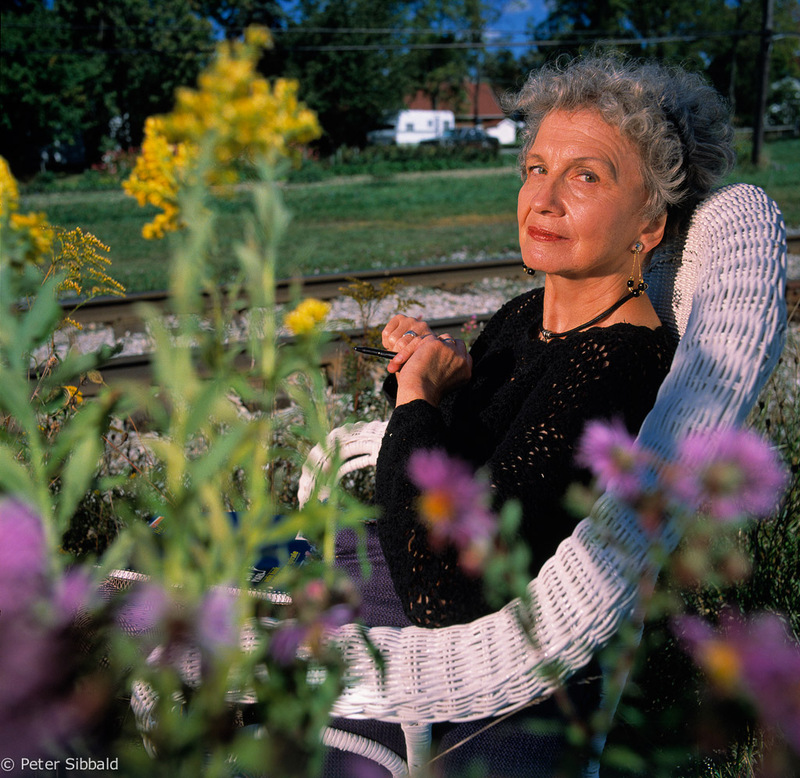 2013 Nobel Laureate in literature, Canadian author and “Master of the Short Story” Alice Munro, near her Ontario home. Shot on assignment for TIME. Penashue Camp, Lake Minnipi, 1996. 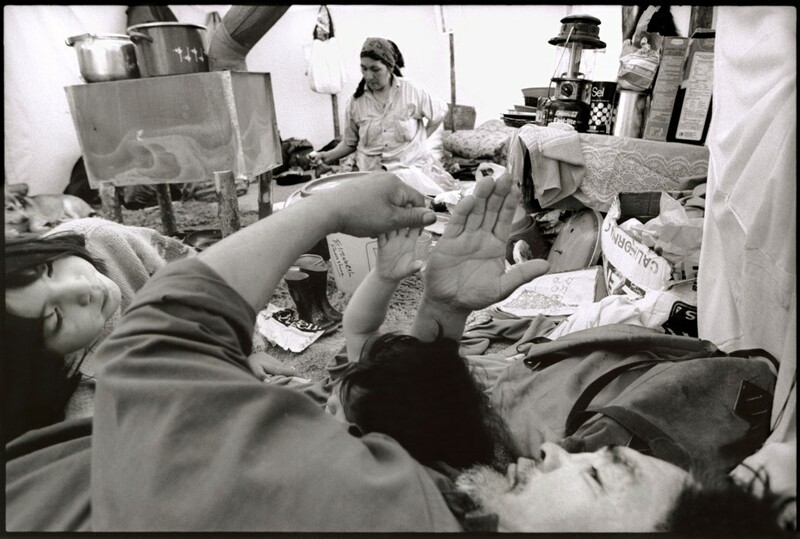 Francis Penashue lolls on the floor of his tent playing with his grandchildren while his wife Tshaukuesh (Elizabeth) Penashue prepares a meal of fresh duck and bannock on their home-made wood stove. The Penashues spend several months a year in the bush reclaiming their traditional Innu culture and passing it on to their children and grand-children. It must have been about this time of the year, 24 years ago, when I met Francis Penashue, although I don’t actually remember our first encounter. I lived briefly with his family—in fact Francis’s father Matthew and partner and their grandson baby George Nuna—in the Mealy Mountains in the interior of Labrador, a place the Innu call Nitassinan, “Our Homeland”. I was intending to stay for only a few days, but became weather-bound for an additional week. It was 10 days that I can only regard as a privilege and that would tie me emotionally to that place and those people, affording me a perspective on the relationship between indigenous and non-indigenous peoples, and change my life. Actually I don’t remember Francis in that 1989 camp per se but, I can still have nightmares about the Francis of that era, for he terrified me. Perhaps Francis was not in the camp at that time because he could not escape the poison that held him in its grip in the village. In those days, and for years before and some after, alcohol was his demon and he raged against it and the circumstances that drew him back to it again and again. No one was too young or too strong to escape his wrath, least of all his little kids or his wife, Tshaukuesh, and certainly no young white man with a camera and a big city attitude. I must have embodied everything he hated. For Francis was part of that lost generation of children wrenched from their families and beaten into submission in the residential schools, though in Francis’s case it was not technically a residential school, but the now notorious Mount Cashel orphanage on the island of Newfoundland. “Kill the Indian in the child” was Canada’s official policy in those years. In the years that followed our first meeting, Francis beat back those demons into some form of recovery. I would stay again with his family in bush camps, but those times, he would be there, the dedicated father, adoring grandfather, sharing with family the traditional knowledge of how to live off the land, knowledge that he had acquired in his earliest years from his elders in the bush camps he was born and raised in. Francis’s sons became hunters and many of their children still know how to live off of and in harmony with the land. For that, Francis must have started to recover pride. Francis and Tshaukuesh’s tent became the heart of those bush encampments. By this time, the little children were no longer afraid of Francis, and there was a constant coming and going of little feet through the tent flap, both to savour Tshaukuesh’s partridge stew and to fill the balsam bow infused air with giggles. In those latter years I knew him, we didn’t talk much, and he never spoke of the cruelty my kind must have inflicted on his child self, nor what of that he passed on to others. And after having my language forced upon him, why would he have wanted to use it to share such pain with me? Thereafter, Francis chose to speak mostly Innuemun as far as I know. That he rose above such deserved hate of my kind to condescend to sharing not only my company but the presence of my camera was huge for me personally. And so, like his children and grandchildren I learned by watching. That was 1996, and I think Francis then was still struggling with remorse. I would like to think that—as later pictures and stories would indicate—Francis found some redemption in the role that he earned as elder and, along with Tshaukuesh, leaders of their people. It was a valiant thing he did—no mean feat of sobriety and wholeness in a social milieu then still highly compromised by multigenerational alcoholism. Many of his generation could not win that battle and succumbed to accidents, poisoning, suicide… indeed are succumbing still as are many their children and grandchildren. But Francis was evidence that the government, a succession of my governments—those groups of democratically elected Canadians who cynical legislation, with the blunt force of violence and with the careless failure to protect the people in its charge from mercury, carcinogens and other toxins into their food, water and air… Canadian governments that are still trying to deprive the First Peoples of their rights, autonomy and land—that they could not, cannot, “kill the Indian in the child”. Earlier this morning CBC Radio journalist and producer Marie Wadden, who has written books about Francis Penashue’s journey, wrote of his final one, that it was Lou Gehrig’s disease that put an end to his life. Release from the tyranny of that disease is, I guess, some sort of blessing. Last evening Francis was removed from the hospital and brought out to spend his final minutes laying in the fragrance of spruce bows of a white canvas tent, cozy with wood fire—home—surrounded by a circle of 200 loving family and friends. To me, that is evidence enough of his redemption, and that redemption is possible, proof to all of us of the importance of sticking to our moral compasses, of keeping trying. One can only hope to have the strength and bravery to do such work, and when our times come, to be so lucky. To Tshaukuesh, Peter, Max, Bart, Jack, Gervais, Robert, Freddie, Angela and Kanani, and your children and grandchildren, I am so sorry for your loss. I am no expert on public broadcasting, but like many Canadian citizens disgruntled with the gradual erosion of the Canadian Broadcasting Corporation’s offerings over the past decade or more (with its increasing repetitiveness in programming and scaled-back budgets for foreign bureaus and investigative journalism), as a regular CBC listener certainly for me this has felt like a “crisis” for some time. But notwithstanding that arguably hyperbolic designation, LeadNow, Friends of Public Broadcasting and SumOfUs.org have been scrambling to bring an important PUBLIC NOTICE to Canadians this past week or so which cannot be disputed: that the CBC is under clear and present threat of imminent takeover by the PMO through a hidden clause in one of the Harper government’s latest (if before he was elected scorned) omnibus bills, Bill C-60, their most recent omnibus budget bill. This is a critical issue. Consider many of the—hmmm, how shall I put this—less than Canadian manoeuvres of the Harper government continuing to be catalogued on blogs such as Tracking Harper as this man systematically dismantles our ‘just society’ and makes Canada the laughing stock of people of good conscience across the globe: on a quick, random check, most of those stories were at least reported, if not broken or indeed further investigated by Canada’s public broadcaster. How many of those important stories would Canadians have any inkling of had the CBC already been under the direct control of the government? Or to put the shoe on the other foot: what would we know of the Liberal government sponsorship scandal or the corruption surrounding Montreal politics and on and on? Regardless of which party one votes for—for indeed every political party in every province and territory has been put under CBC’s microscope at some point— if it is not the first and foremost job of journalism, and in particular public broadcast journalism, to hold power to account, what relevance if any could the CBC hold once this bill is fully implemented? OR aaahhhhh… is that Harper’s secret strategy: not so much an agenda to take over control over who is hired and what is said by each and every host and news anchor of the CBC which might overwhelm even his allegedly superior micro-management capabilities, but to fast-track the apparent irrelevance of the CBC in its core role so that even this country’s business, academic and culture communities turn away in disgust? Harper has made no secret of his disdain for the public broadcaster since before he was elected, not to mention at least the latter two of those constituencies. (And with bloopers like CASL, Bill C-28, his recent bludgeon bill—which on its surface presented the wholesome and honourable aspiration of eliminating SPAM and egregious telemarketers—even thoughtful members of Canada’s business and legal communities must be wondering about a government that would write legislation that (in)advertantly also outlaws future outreach to new clients/customers, including by businesses yet to be created, and possibly even curtails any new B2B e-communications. ) But I digress. The mere association of these stories in one show can only provoke the kinds of interconnectedness of ideas that this small offering of a blog strives to do on many of the same subjects. Congratulations Anthony Germain, Anna Maria Tremonti and team. Also a shout-out to CBC Q‘s Jian Ghomeshi’s for 2013/05/10 CBC pride-filled prologue today about CBC content (which further spurred this blogpost) and his rant last Friday 2013/05/03 underscoring my peeve about the recent dismissal of we “citizens” (who consider that the intrinsic privilege of our nationality bears far more responsibility than merely voting or paying taxes) as “taxpayers” or “voters”. While many are writing, reporting, broadcasting and blogging on this already the past few days, this may be the my first of many related posts on my blog about this new movement across Canada. There is something about it that has the same raw authenticity that the Occupy movement did a little over a year ago. The singular difference, I sense, is that the sentiment and knowledge that fuels it has been hundreds of years in the amassing and the pent-up anger driving it—rightly in my opinion—is generations old, residing in the hearts of four or five generations of people currently extant. On the surface at least Idle No More is the creation of four young women, 3 Native and one non-Native, in response to Canadian Prime Minister Stephen Harper’s, ham-fisted Omnibus Bill C-45—with (among many travesties) its rights grab of First People’ land rights and annihilation of protections to Canada’s precious clean water. But beyond that, The PM’s apparently blithe and nakedly insulting unconcern about Attawapiskat Chief Theresa Spence’s hunger strike, now in it’s 10th day (tbc), merely a stone’s throw from the PMO has jabbed already raw nerves from sea to sea to shining sea. Idle No More’s official web site is the go-to place on matters and information related to the movement. Please beware: immitators and other’s attempting to forward discreditable agendas are already springing up. It’s a lot to wade through though so as I begin to get up-to-date on what the movement is myself, I thought I would focus what I’m learning. Rather than attempting to interpret, here is the beginning of a compendium of what the people themselves are saying. To begin with, and perhaps of greatest importance to the greatest number, in the words of University of Winnipeg Director of Indigenous Inclusion Wab Kinew in the Huffington Posta couple of days ago: Idle No More is “more than just an “Indian Thing””. And even if here and there the odd Canadian might be so calous and colonially imperial in his or her way of thinking as not to give a damn about social justice, First Nations or First Nations land rights, perhaps they’ll sit up and take notice of the new threats to their treasured cottage properties and country retreats and their own now threatened rights. For these and other reasons, I think Idle No More may grow wider and endure to become, ironically, one of Prime Minister Stephen Harper’s enduring legacies. But wait, there is still time for him to do something about fixing this. Guest Column: Cynical Canadians: Shame on you! But it would be irresponsible—undemocratic—to accuse the government of taking such cynical actions, or for that matter the opposition who has said relatively little in the wake of this latest prorogation—the second in a year—when all these well paid public servants are away from their offices, support staff and other resources they might use to defend themselves, which taxpayers pay for. Since that damn commie outfit, the CBC began reporting on the new Facebook group Canadians Against Proroguing Parliament ) late yesterday the groups numbers have increased by 25%, as updated in the past couple of hours. This is ridiculous! You so-called “engaged Canadians” and especially those belonging to that most infernal of special interest groups—FAMILIES—who claim you care about our country, and yet who yourselves so cynically would think so badly of our government, should feel ashamed of yourselves. You should ignore silly, childish distractions like Facebook and those few remaining ways that citizens have left of engaging in the political process, and get back to your day jobs (and second night, night jobs and off-farm jobs) so you can keep those tax dollars rolling in and keep those big stone buildings in Ottawa heated, and lights on—even if nobody’s home—so the pipes don’t freeze. That way, when the government finally is ready to come back to work, they don’t have to waste more time and our money debating a budget full of emergency building repair bills. And one more thing: don’t waste your time trying to contact your MP to tell them to get back to work; they’re on vacation for the next Quarter, and won’t be picking up their messages until late March. Post Script: And for that matter, that damn CBC shouldn’t be allowed to report on such matters of public interest. When the government finally does get back to work, if they ever survive the confidence vote on their budget, they should finish what they started with that despicable band of pinko intellectuals: eliminate their funding altogether: muzzle’em and then scrap’em!! The opinions expressed on this page are for informational purposes only. Mixed Farmin’ makes no claim to the opinions expressed by our guest columnist. Mixed Farmin’, its affiliates and content licensors assume no liability for any inaccurate, delayed or incomplete information, nor for any actions taken in reliance thereon.